John Theocharopoulos is a Physical Education teacher, mountain guide, trainer and instructor for mountain schools, responsible for the Sports and Recreation Center (TAC). He was a winner of the Greek Championship in Ski Mountaineering for 15 years (1993-2007) in a row. Professor of Physical Education and graduate of the Faculty of Physical Education and Sport Science. Mountain Guide of the Hellenic Mountain Guides Association (HMGA). Mountaineering-Climbing Trainer and Alpine Ski Instructor of the Hellenic Federation of Mountaineering & Climbing. Mountain-bike Instructor of FBS / GG. He undertakes the education of mountaineering, climbing and ski-mountaineering schools, the organisation of competitions and adventure games, as well as personal training to people who wish to take up mountain sports. He performs few-hours, daily or multiple-day sports expeditions in nature for enthusiasts of mountain sports. Sports is a way of life for John. He has done more than 300 renowned high difficulty climbing routes, over 60,000 meters in total of climbing routes in Greece and the Alps. 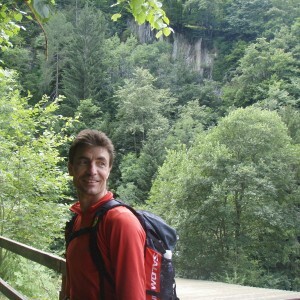 From 1993 to 1994 he participated in two World Sports Climbing Championships. Solo climbing repetition of GIONA mountain in Plaka in the route Sykias-Michaelides in August 1990. First Greek repetition of WALKER in GRAND JORASSES of MONT BLANC (July 1992). First Greek repetition in Switzerland on the northern climbing slopes of MATTERHORN (July 1993) in one day. First Greek repetition in Switzerland of the northern climbing slopes of EIGER (July 1994). For this activity he was honored with an official award from the Hellenic Mountaineering and Climbing Federation. Participation in the Himalayas in the northern part of EVEREST peak in spring 1996 on Costas Tsiveleka’s expedition. Participation in the Andes (August 1999) in Huana Potosi peak (6088 m.) on an expedition of Hellenic Mountain Club of Acharnes. Greek Champion of ski mountaineering from 1993 to 2007 for 15 consecutive years. Participation in 8 European ski mountaineering Championships. Participation in 4 World ski mountaineering championships of ISMC as a member of the national team. Participation in 6 PIERRA MENTA races (four-day race ski mountaineering). He made the first ski mountaineering downhill from Louki of Mitikas peak on Olympus mountain. He has repeatedly participated in marathons and mountain marathons. His best time running the classical Athens Marathon route is 2h55min. Participation in the Ultra-Trail du Tour du Mont-Blanc organised by North Face of C. C. C. competion (86 km.) on 24-25/8/2007 with time 16h09’51”. Participate in more than 150 races. Participation in at least 18 adventure races. Leader of Salomon Hellas Team from 1999 to 2006. Participation in world championships three times. Read about the activity of John Theoharopoulos in mbike magazine.